Industrial dust can be significantly more harmful than the dust residing under the bedroom dresser, and causes numerous deaths every year by dust explosions and fires. In fact, combustible dust produces significant hazards when the small particles are exposed to ignited chemicals or a flammable atmosphere. Many factors are involved in dust fires and explosions. However, common features of these accidents include a blast reaction from mixing combustible dust (the fire fuel), heat and oxygen. 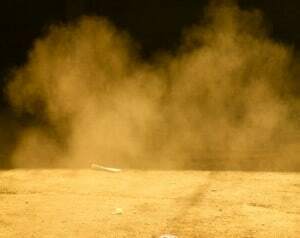 The dust acts as a fuel, creating deflagration caused by dust particle concentrations in a confined space, such as inside an unventilated vessel or a room in a manufacturing plant. When dust is mixed with oxygen, heat, confinement and eventual dispersion, and explosion often occurs. In many incidences, a single explosion involving dust can quickly trigger secondary fires or explosions. This is because the combustible dust releases particles in the open atmosphere, reacting to heat. Sometimes, the secondary explosion is significantly more destructive than the first one. In fact, OSHA (Occupational Safety and Health Administration) notes that there are substantially more deaths involved in a secondary explosion when compared to the primary one. Combustible dust fires and explosions can usually be prevented. To be effective, supervisors and management must conduct a complete hazard assessment on all handled materials, and evaluate workplace spaces, conducted operations, and any potential source for ignition. Many times, supervisors and managers can rearrange, repair or remove items, devices, components and materials to secure the safety in the workplace. Additionally, company owners can reduce the potential of combustible fires or explosions with a hazardous inspection. The inspection usually involves testing every space in the plant to seek out the presence of combustible fuel. Often times, it is necessary to install dust collecting systems and a filtration system as a way to minimize the escape of combustible dust from the facility's processing equipment or ventilation system. It is also essential to install easy-to-clean surfaces that minimize the accumulation of dust throughout the workplace. Effective, safe procedures and practices should be developed and implemented to show correct cleaning methods. Proven safe cleaning methods will avoid generating dust clouds in the work area. Only vacuum cleaners should be used for collecting dust. In addition, the workforce should be properly trained on the most effective ways of minimizing the potential of explosions or fires caused by dust. Every worker must use extreme caution when around dust atmospheres and heated surfaces. Industrial trucks should be used properly and static electricity in the facility should be controlled in every working environment. Smoking and any type of spark or open flame should be banned from the facility. Employers need to take steps to minimize the potential of friction caused by mechanical sparks. In addition, separator devices should be used/maintained to remove foreign materials that have the potential of igniting combustibles. Often times, individuals involved in a combustible dust fire or explosion receive injuries or suffer death that could have been prevented if proper measures had been taken. A skilled Chicago industrial injury attorney can usually build a solid claim for financial recompense by proving how the negligent actions of the employer, plant manager, supervisors, product manufacturer or other party caused the explosion. Call (888) 424-5757 to speak with a dust explosion attorney at Rosenfeld Injury Lawyers LLC. The law firm can take legal action after determining wrongful conduct or negligent actions of the employer, company, or third party individual/entity to achieve the highest level of financial recompense.